"For fans of The Paris Wife, a sparkling glimpse into the life of Edith Wharton and the scandalous love affair that threatened her closest friendship They say that behind every great man is a great woman. Behind Edith Wharton, there was Anna Bahlmann—her governess turned literary secretary and confidante. At the age of forty-five, despite her growing fame, Edith remains unfulfilled in a lonely, sexless marriage. Against all the rules of Gilded Age society, she falls in love with Morton Fullerton, a dashing young journalist. But their scandalous affair threatens everything in Edith’s life—especially her abiding ties to Anna. At a moment of regained popularity for Wharton, Jennie Fields brilliantly interweaves Wharton’s real letters and diary entries with her fascinating, untold love story. 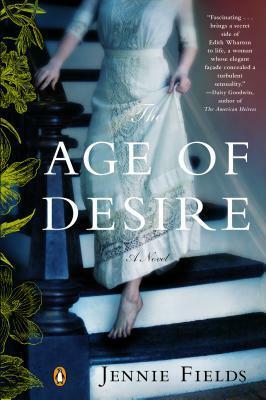 Told through the points of view of both Edith and Anna, The Age of Desire transports readers to the golden days of Wharton’s turn-of-the century world and—like the recent bestseller The Chaperone—effortlessly re-creates the life of an unforgettable woman." Like earlier stated, I read this for the publisher/author to give my unbiased and honest opinion. However, I did connect with Anna, so the book was not a loss for me. I really liked Anna and found some similar qualities in her that I find in myself. Edith was kind of a jerk to Anna. Perhaps that had a hand in why I had issues with Edith. Meh. But yeah, Anna was neat and her POV was a million times better. Oh. I also had issues with Edith, because of how she treated her husband Mr. Wharton. Poor guy...I get that he was a jerk sometimes and he didn't shower Edith with the love and attention she wanted. Plus, he liked to drink...a lot. However, he had issues. If he was living in modern times, he would have been diagnosed with severe depression...he was manic depressive. He had serious mental things going on. Edith knew that, but yet, she was horrid to him at points. Another wall that blocked me from connecting with her. Overall, this was a pretty good read. I went through it pretty quickly and I highly enjoyed Jennie Fields writing style. She's really good. Even though I didn't like Edith and her POV, I really did enjoy Anna's, so it made the book bearable. I'm not sure if I would ever pick up Edith's works, but it was interesting learning about a famous woman writer in a time of major change in the world. I would recommend this to those that like Historical Fiction with some romance weaved in. Out of five stars, I shall stamp this with 3 stars.